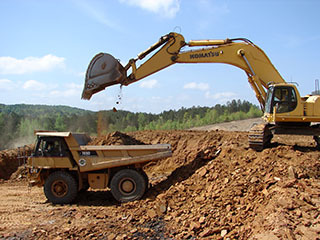 H. N. Donahoo Contracting Co., Inc. | Let us show you the "Donahoo Way"
When your project calls for mass excavation, we have the equipment and manpower to get the job done. Whether it is managing self-performed work or the work of a subcontractor, we have the experience to make sure the work being performed is done in a manner that meets or exceeds project specifications. Cut to Fill Grading is a major segment of our operations. 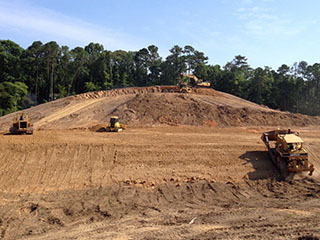 Whether it is a subdivision, apartment site, commercial building site, school, hospital or golf course, we can put your project on grade with experienced personnel and state of the art technology. 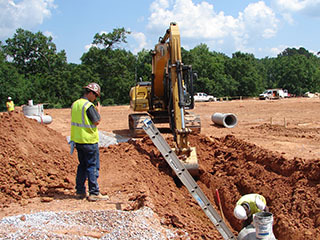 We self-perform all the storm water management, sanitary sewer, water mains and services on the project, which allows us to coordinate their installation with other aspects of the project. This helps to minimize issues that can occur. H. N. Donahoo Contracting Co., Inc. has been serving Alabama customers for over 90 years. When it comes to site development, few contractors can match the heritage of H. N. Donahoo Contracting. With a vast amount of both residential and commercial experience, a solid labor force and a diverse equipment fleet, we are able to provide the resources to match most development needs. If your project requires a professional contractor with a proven track record who will stand behind their work, let us show you the “Donahoo Way”. Doing it right the first time, and then standing behind it. Are You in Need of a Quality Contractor for Your Next Project?